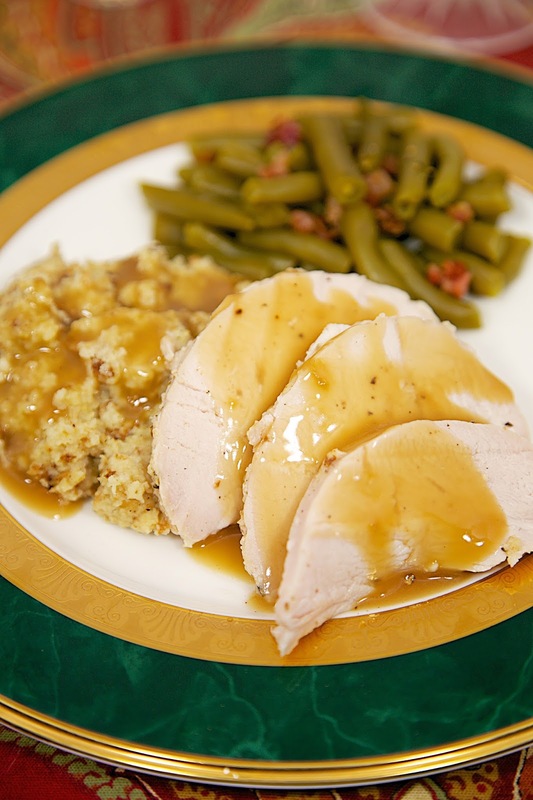 Slow Cooker Turkey & Cornbread Dressing - Thanksgiving in a snap! Just dump everything in the slow cooker and let it work its magic! Boneless turkey breast and homemade southern cornbread dressing made in the slow cooker. Easy holiday recipe! I know most people have limited oven space when it comes to making holiday meals. Normally people are looking for alternative cooking methods for side dishes since the turkey takes up most of the oven. I thought I would try making the Turkey and Cornbread Dressing in the slow cooker. I made my Mom's cornbread dressing recipe and added more liquid since it would be in the slow cooker several hours. I used a boneless turkey breast and it fit perfectly in my 6-quart slow cooker. My turkey took about 4 hours to cook in the slow cooker with the cornbread dressing. I had plenty of room in the oven for my squash casserole, green bean bundles and rolls. I even had space to bake a pecan pie! Chop onion and celery in food processor. Crumble cornbread and add remaining ingredients (except turkey). Stir well. Place dressing in slow cooker that has been sprayed with cooking spray. Remove turkey breast from wrapper. Season turkey with salt, pepper and garlic powder. Cover and cook on HIGH 3 1/2 to 4 hours. This looks and sounds fantastic. How did you make the gravy? I'm assuming all the liquid in the crock pot is absorbed into the dressing. Thank you and have a very blessed Thanksgiving! I use a packet of Turkey Gravy mix. I just prefer it to the homemade gravy. Awesome! Thank you. I just looked at this recipe done in the oven and now I am torn as to which one I want to try. We'll be in Canada for Thanksgiving, so maybe I'll make them the oven version and when we get home I'll make the crock pot version for us. 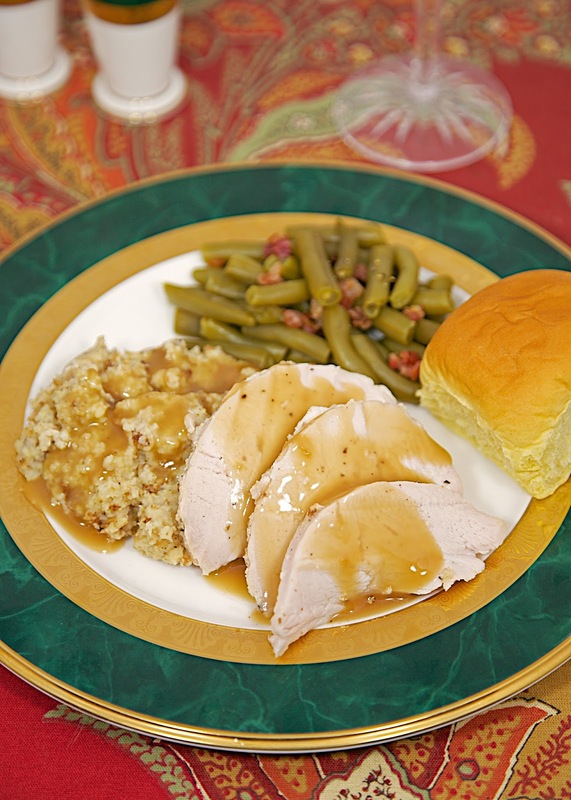 The slow cooker is my favorite way to cook a turkey! Never tried it with the dressing, great idea! This sounds like a great idea that I may use a couple of times a year, not just on Thanksgiving! This looks amazing and perfect for just my hubby and I! Do you think I could sub out the cornbread for regular bread? I don't think this dressing recipe would work with plain white bread in place of all the cornbread. You can try it, but I'm not sure of the results. Is the cook time and temp the same for the metal pan?